In "Digital Printmaking: Place, Time, Vision" Carol Pulin writes about the work of Digital Atelier artists, Bonny Lhotka, Karin Schminke and Krause. The artists of Digital Atelier have taken the concept of showcasing their work to a new level. 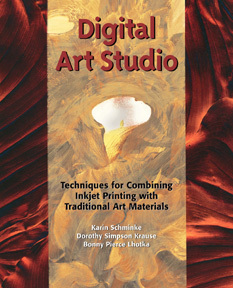 In addition to a standard version of a hardcover coffee table book of their fine art, Digital Atelier, they have used a variety of cutting edge digital printing technologies to create a special collector’s boxed set that accommodates a piece of original art by each artist and includes essays by Carol Pulin, Director of the American Print Alliance and Editor of Contemporary Impressions, and Harald Johnson, author of Mastering Digital Printing. Both the 74 page book and the original art in the boxed set were produced as a signed and numbered limited edition of 100. The book was printed on the HP Indigo press 5500 and bound by Acme Bookbinding. The 11 x 14 inch book and three pieces of art fit together into an archival black anodized aluminum box by Pina Zangaro. Universal Laser Systems engraved the black aluminum box to match the design of the foil stamped fabric hardcover of the book. The limited edition original prints, one by each of the artists, include; Beachflowers by Krause, Water by Lhotka and Margaret’s Meadow by Schminke. The book at $85 and the boxed set is $650. They can be ordered from Bonny@Lhotka.com. An article by Eileen Fritsch about the creation of Digital Atelier is onlline. Both a PDF describing the process and a briefer explanation of the process, designed as a PDF broadside that can be folded into a small book can also be downloaded. The book. Digital Art Studio, has 160 pages, includes 300 full-color illustrations with step-by-step instructions. One of the demonstrations from page 38 - 389, Base Method; Preparing Nonwoven Fabric has been posted to give a sense of the way the content is presented. Other publications by Digital Atelier artists can be selected from the carousel below which is linked to the Amazon website where you can "look inside the book" for additional information. Update: please note that Oce no longer sells the FCPLS4 film used for creating transfers with printers with pizza wheels (see Chapter 5). A replacement film can be found at Digital Art Studio Seminars. You can see work by Dorothy Krause, Bonny Lhotka and Karin Schminke here and on their individual websites. Digital Atelier is a registered trademark of Dorothy Simpson Krause, Bonny Lhotka and Karin Schminke. All images copyright of the artists.